EDMONTON – A standoff between two Ethiopian groups attracted more than 45 police officers, some in riot gear, to a west end community league Saturday afternoon. At around 3 p.m., police responded to a protest in the parking lot of the Belmead Community Centre at 182nd Street and 90th Avenue where more than 100 demonstrators had gathered. Officers called for backup after they were surrounded by a large group, Edmonton Police Service said in a news release. The protest started escalating when demonstrators were denied access to a meeting of about 40 people that was taking place inside the community centre, said EPS spokeswoman Patrycia Thenu. Several police officers blocked off the entrance to the building and made protesters stand on the sidewalk on the other side of the parking lot. There were more than a dozen police vehicles in the parking lot and blocking off the entrance to the community centre. There were several more police vehicles parked around the corner behind a strip mall on 89th Avenue. Just before 5:30 p.m., an Edmonton Transit System bus drove up behind the building and the meeting attendees were escorted onto it. The protesters on the sidewalk started cheering, waving Ethiopian flags, one Canadian flag, and placards. When they got to the entrance of the community centre’s parking lot, some started chanting and dancing in a circle. 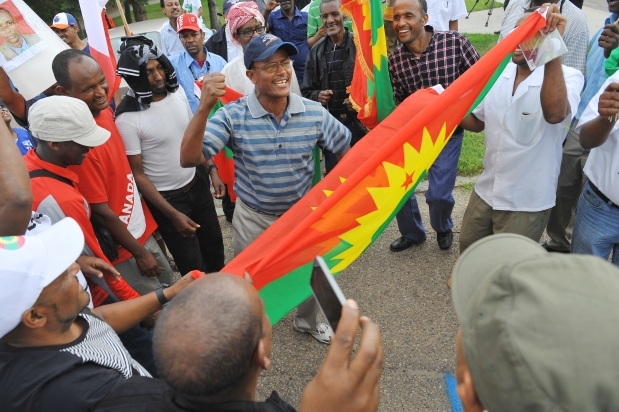 Protesters claimed the individuals at the meeting were representatives of the Ethiopian government. Sayf Abdi said the group is trying to collect money from Ethiopian-Canadians to fund development projects in their homeland, such as a massive hydroelectric damn in the Blue Nile River. After talking to the media, most of the protesters disbanded. At 6 p.m., the ETS bus returned and dropped off the meeting attendees so they could collect their vehicles and go home. Many wore white hats and had booklets with the Ethiopian flag on it. Co-ordinator Desalegn Abara said about 120 members of the Ethiopian-Canadian Development Discussion Forum had gathered at the community centre for a meeting. He said the group is not affiliated with the Ethiopian government. “Our goal is to provide information where people can participate either by investing, or through their skills, or by supporting the (development) projects,” he said. He said protesters did not get into the building. However, Abara said he is disappointed that the meeting was interrupted. “Unfortunately, the police collaborated with them and they stopped our meeting, we cut it short, as criminals we’ve been put in a bus and (taken) out of the premises,” he said. He said the meeting will resume at a later date. Thenu confirmed there were no injuries among the protesters or the individuals at the meeting. She said the demonstrators did have a permit for a peaceful protest. No arrests were made or charges laid at the scene, but charges are pending against one male protester upon further investigation, the EPS news release said. Posted on July 22, 2013, in Uncategorized. Bookmark the permalink. Leave a comment.